Laddu is a must have in our house for Diwali. 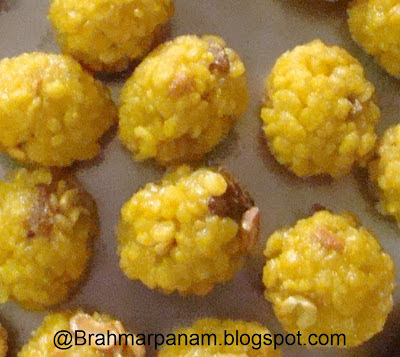 My grandma and mom are experts in Laddu and here is the recipe for you to enjoy on Diwali! Heat Sugar and 1 cup water in a pan. The Sugar syrup should reach a single thread like consistency which means if you dip a spoon and lift it up, the syrup should drop like a single string. Remove the sugar syrup from the stove and add the food colours and mix well. Now mix the Gram flour with just as much water required to make a dosa batter like consistency. Heat oil in a Kadai. When the oil is really hot, test the heat by adding a drop of the batter into the oil and it should immediately sizzle up. Now hold the big perforated spoon with round holes just over the Kadai and take a laddle full of the batter and pour it on the perforated spoon and quickly spread the batter so that small boondis will fall into the oil. Now quickly remove them from the oil and add them to the sugar syrup and mix well. You should not allow the boondis to fry too well and become crisp as they will break and it will not be possible to make the laddus if they are too crisp. Likewise pour all the batter through the big perforated spoon and add the boondis to the sugar syrup. Once all the boondis are added to the sugar syrup, add the roasted cashews and raisins and the diamond sugar candies and mix everything well. Make small balls of the laddu like the size of a golf ball and serve!